The World Cup’s group stage is coming down to the wire: With one game to go, there are a few ways the United States can keeps its championship hopes alive. Here are all the potential scenarios that would result in our boys advancing to the round of 16. 1. U.S. wins or draws against Germany: The U.S. team moves forward to the knockout round if they beat Germany or tie with them. 2. Ghana and Portugal draw: If the teams end their match in a tie, then the U.S. and Germany advance and both Portugal and Ghana are eliminated. 3. U.S. loses to Germany, Ghana beats Portugal by 2 goals, Ghana remembers true meaning of sportsmanship: This scenario requires Ghana to realize that the U.S. men’s team worked really hard for this and then selflessly offer up their spot. 4. U.S. loses to Germany but the U.S. team writes “Germany” over “United States” on their jerseys: The U.S. team moves forward and once the first elimination game with “Germany” is played, FIFA will be too embarrassed to say anything about it. 5. Ghana beats Portugal, Portugal beats Ghana: The presence of two contradictory realities coexisting in the same timeline would cause a disintegration of the linear progression of time as we know it, creating an infinite plurality of realities in which the United States both wins and loses the World Cup. 6. 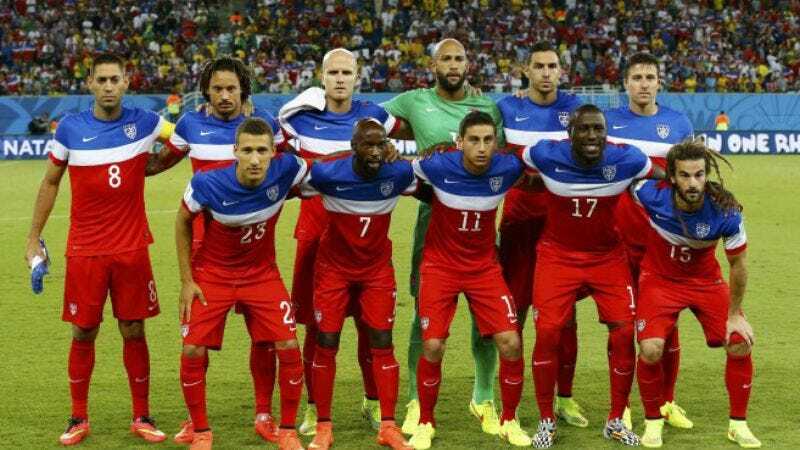 U.S. loses to Germany by 46 goals, Ghana and Portugal draw: Believe it or not, the U.S. would advance if this happens. 7. U.S. loses to Germany, but Germany’s grandpa dies: It’s a long shot, but if Germany’s grandpa dies suddenly and they have to miss the game in order to go to the funeral, then according to FIFA rules, the U.S. will advance to the next round uncontested. 8. U.S. loses to Germany, but then Germany is disqualified because upon review of the game, referees notice Germany was using their hands the whole time: Touching the ball with your hands is a clear violation of the rules of the game, and if the refs discover Germany was using it to their advantage to beat the U.S., the win would be voided and the U.S. would advance. 9. Ghana beats Portugal with enough goals to win tiebreaker, U.S. loses to Germany, U.S. runs out onto the field celebrating to Queen’s ‘We Are The Champions’: While the U.S. would technically be eliminated in this scenario, the fact that they are celebrating while listening to ‘We Are The Champions’ might be enough to confuse FIFA officials, who could assume that they must have made a mistake in thinking that the U.S. team lost and thus let them advance. 10: During the U.S. vs. Germany match, the German team abruptly evaporates into an acrid vapor: This would be great for the U.S. team.